Can we take a moment to talk about Rose Byrne? The small-eared Australian actress has been a comedic highlight of everything from Get Him to the Greek to Neighbors, with her standout role being Kristen Wiig’s arch-nemesis Helen in Bridesmaids. Byrne’s comedic talent has always been criminally under-appreciated, as evidenced by Melissa McCarthy’s much broader Bridesmaids performance garnering an Oscar nomination while Byrne’s complex, nuanced, hilarious turn as Helen—a woman so calculated and cunning that she throws a bridal shower where the party favor for everyone is a puppy—went relatively unnoticed. Hell, poor Rose Byrne even found herself in the dreadful Annie remake last winter, and she somehow came out unscathed! This woman can do no wrong, which is proven even more thoroughly by her performance in Paul Feig’s Spy. As Rayna Boyanov, an international fugitive with a mouth like a sailor and a penchant for feeding men poison until their throats dissolve, Byrne’s villainess is the perfect counterpoint for Melissa McCarthy’s titular hero. 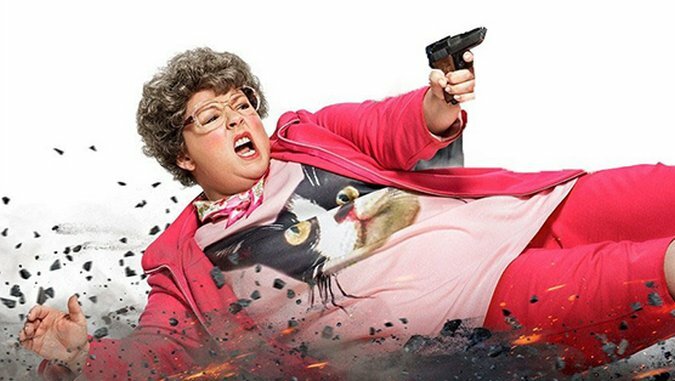 Spy marks Melissa McCarthy’s third effort with director Paul Feig, following Bridesmaids and The Heat, and the two keep their streak a winning one: Spy manages to be funny, thrilling and empowering all at once. McCarthy plays Susan Cooper, a skilled CIA analyst who finds herself spending her days behind a desk rather than out on missions. While her colleagues fight off international baddies, Susan deals with workplace politics and an ever-increasing office rodent problem (at one point she has to do her job with a family of bats nesting in her hair). When one of the CIA’s most skilled agents (Jude Law), searching for a deadly bomb, goes missing at the hands of Byrne’s Rayna, Susan’s boss (Allison Janney) decides that she must send in a completely unknown agent who Rayna won’t recognize—and that agent, of course, is Susan. Within hours, Susan is off to Europe, armed with horrifyingly embarrassing disguises (cat lady, frumpy aunt, etc.) that will help her seem as non-CIA as possible. As Susan delves deeper and deeper into infiltrating Rayna’s life. she discovers that she is more competent than her coworkers, and herself, believe. Spy works so well simply because it believes in its star. A proven comedic powerhouse, Melissa McCarthy has shown that she shines whether the material is solid (Bridesmaids) or not (Tammy), and as Susan Cooper, McCarthy is given her most fleshed-out role to date. She nails it: Susan is a woman who has spent most of her days talking into agents’ earpieces rather than joining them in the field, yet she is shockingly lethal when put into action. She takes down bad guy after bad guy, all the while spewing insults that would make Howard Stern blush. And so, Spy is at its best when Susan and Rayna go toe to toe, projecting the kind of lightning-fast verbal venom at one another that McCarthy and Byrne so easily chew up and spit out. They make the audience lick up what remains. Susan is vulnerable, but far from pathetic. Yes, she harbors a hopeless crush on Law’s suave-yet-daft 007-esque spy, and she is forced to wear dumpy disguise after dumpy disguise, but she still subverts all of the obvious jokes the film throws her way. As soon as Susan takes the mission into her own hands, she dresses sexily, immediately garnering significant male attention (which is significant comment all unto itself). She also fights brutally, showing everyone (on screen and off) who doesn’t believe in her that a disregarded woman is just as effective as a much-lauded man. Susan’s biggest naysayer comes in the from of Rick Ford (Jason Statham), a secret agent who seems to possess all the credentials for being a top-notch spy, yet absolutely none of the skill. Ford’s knack for being so inept that he actually makes every mission he’s on that much more exceptionally worse, means that when he jets off to Europe to lend Susan a hand, she ends up his saving grace as he screws up colossally time and time again. The relationship deftly skewers audience and character perceptions of the two: On paper, Susan should be the nincompoop, but she winds up being the calculated mind and the nimbly strong backbone Ford needs to stay afloat. Throughout, Statham gleefully pokes fun at his straight-faced, macho persona by embracing Ford’s ineptitude. It’s a joy to watch. Spy is a violent action-comedy that never once is able to take itself too seriously, and yet has a lot of serious commentary to lace throughout all of its whimsy about just how powerful any woman can be when given the same resources and consideration as any other male. Feig and McCarthy nail it yet again, accompanied by a cast that all seem down for the ride, but again: Rose Byrne. Rose Byrne! Spy’s surprise may not be that Susan turns out to be an unassuming hero, but that she is matter of factly a deserved one, the only thing standing between her and unmitigated success being yet another upstanding performance by one particular small-eared Australian actress.